Testosterone Therapy Lawsuits Filed In Consolidated Litigation Allege That Men Suffer Heart Attack, Stroke And Death After Using Testosterone Products To Treat Hypogonadism. 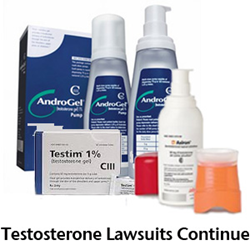 In January, the U.S. Food and Drug Administration announced that it was launching an investigation into all FDA-approved testosterone products, such as AndroGel, AndrodermkAxiron, Depo-Tesosterone and Delatestryl that treat hypogonadism, which is a low level of testosterone in men due to an underlying medical condition. The FDA decided to reassess the safety of the drugs based on the agency’s review of two studies that showed cardiovascular risks associated with testosterone use in older men. The first study published in the November 2013 Journal of the American Medical Association, found that older men who had underlying cardiovascular disease and took low testosterone treatment had a 30 percent increased risk of having a stroke, heart attack or death compared to men who did not take the low testosterone medication. The second study published in the PLOS One Journal on January 29, 2014, found that men over 65 and younger men with a pre-existing heart disease were at a greater risk of having a heart attack within the first 90 days after taking low testosterone drugs for the first time. The FDA held a meeting in September for two of its advisory panels to weigh in on the issue of whether cardiovascular risks are associated with testosterone replacement therapy. The Bone, Reproductive and Urologic Drugs Advisory Committee and the Drug Safety and Risk Management Advisory Committee voted 20-1 in favor of the FDA restricting the population of men who should be prescribed testosterone drugs, including men who have problems linked with aging, such as low energy and libido, according to a New York Times report. The two panels also voted 20-1 to have testosterone manufacturers further examine whether use of their products is linked to cardiovascular risks. Bloomberg reported that testosterone use nearly doubled from 2010 to 2013, when 2.3 million men were prescribed testosterone treatment medication. The increased use translated into increased sales, particularly for AbbVie, which Bloomberg called the “market leader” of testosterone products. In 2013, AbbVie reported $1.04 billion in sales of AndroGel, its blockbuster testosterone topical gel. Court documents indicate that one of the testosterone therapy lawsuits was filed on behalf of a New Jersey man who alleges that he suffered a heart attack one month after taking Axiron. The lawsuit against Eli Lilly, the company that manufactures the testosterone drug Axiron, was filed on September 29, 2014 in the U.S. District Court, District of New Jersey.